I hope you all had a wonderful Mother's Day weekend whether you were the guest of honor or just spending time with the mother figure in your life. My in-laws were visiting over the cold, rainy days. We managed to go out to dinner with them Friday, sneak in a date night for ourselves on Saturday night (Nutella + peanut butter crepe? Yes! ), and relax a bit despite Stephen being gone most of Saturday for a track meet. I visited with my parents earlier in the week. Mother's Day also happened to fall on my dad's 65th birthday, so a very happy birthday to him! Being a mother has tested my mental and physical strength in so many ways. I remember the very day we brought Ada home from the hospital. I had never been so exhausted in my entire life. I remember many times in the first weeks of motherhood wondering why I wasn't feeling connected to my baby. Everything was so hard. My breasts were like rocks and leaking everywhere. I had night sweats. My body was unrecognizable. Ada cried and cried and cried. And I was so, so, so tired. My life wasn't about just me anymore. What a wild transition that was. With time, though, I fell in love with my little babe. We got into a groove. Sure, there were bumps -- sleepless nights, teething, etc. But being a mom eventually felt natural and, yes, wonderful. And then when we discovered Ada would need brain surgery, I spiraled into another amazing feat of motherhood. The fear and worry was constant. The lack of control sucked the air out of my lungs. I actually don't remember much from the first six months after Ada turned two. We made it through . . . but the anguish was like nothing I had experienced up until that point. Toddler years with Ada were remarkable. Despite everything we went through, Ada grew and developed on schedule. Watching her learn new things . . . seeing her develop into a tiny person before our eyes. Wow. It's the stuff that makes life feel like it has meaning. When we started trying to conceive another child, that tested my strength as a mother yet again. Like, to the breaking point. It was pain and confusion like I had never known. But you all know about that story. Being a mother to Eloise has been challenging in its own ways. It was like my newborn mom muscles had atrophied. It was hard getting them back again, but we've managed. Eloise is a totally different person with her own quirks and joys. She has her own light. And she fits into our family so well. I love watching my two girls interact. There's so much more I could write. But the point is this: Being a mom is definitely all the things. Sometimes spread out. Sometimes all at once. It's beautiful at times. There are days when I get these bursts of energy and vitality -- a true zest for life. It can also be downright ugly and draining. Maybe I don't shower for a few days and find myself in a fit of tears after a particularly bad stretch. It happens to the best of moms. It's nothing to be ashamed of. Because why? 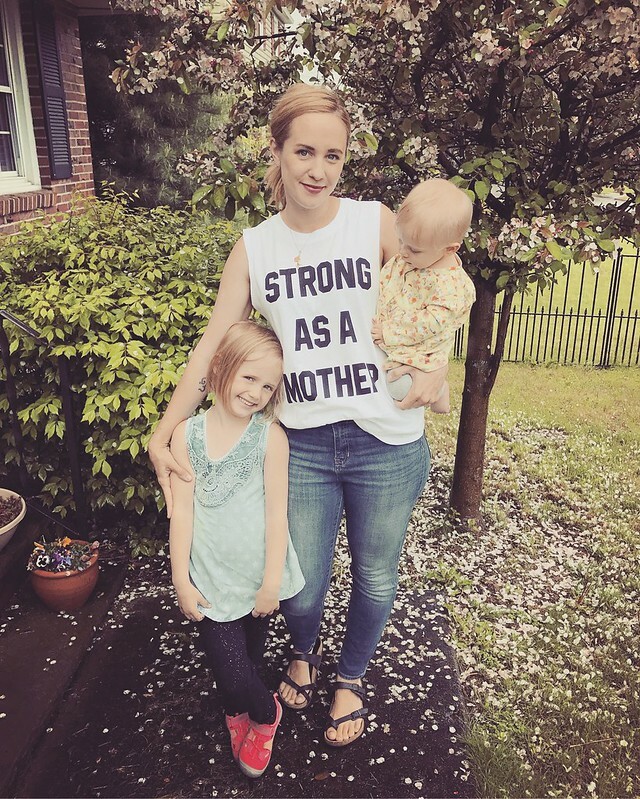 Because mothering requires an almost superhuman strength. You have to shoulder so much for your family . . . for your kids . . . for yourself. Anyway, I hope some of you mamas got to give your muscles a bit of a rest yesterday. Or maybe had the luxury of getting them massaged. I enjoyed seeing a movie by myself in the theater. One of my absolutely favorite activities. Then I ate my favorite sandwich for dinner complete with my favorite red wine and favorite chocolate cake for dessert. It was surely sweet. Happy Monday. Back to the everyday grind. Back to the continuous training that we call motherhood. From what I'm told, it never ends. There will always be new challenges and triumphs.